Evil COO Jason Moeschler shows off the new Wreckoning LB in subtle but stunning bronze color. “I feel like I’m drunk on demos,” commented a rider in line at the Santa Cruz booth. It was his 12th test run of the day — and he still had two hours to go. 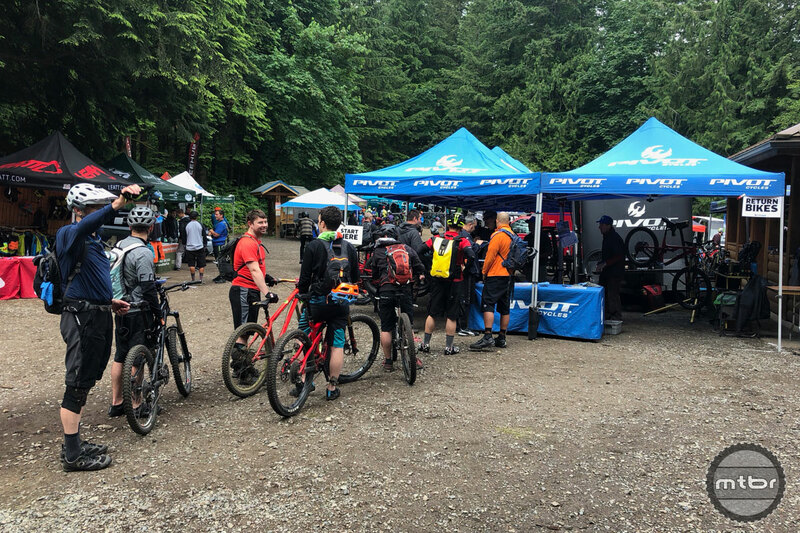 In a decidedly popular twist this year, the Evergreen Mountain Bike Alliance event offered demos from nearly all major bike makers for $40 — $20 for members. 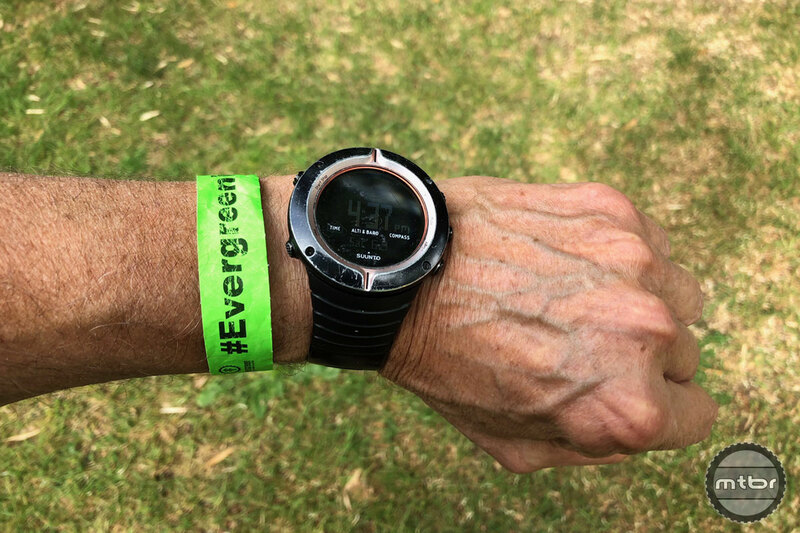 At the Evergreen booth, many demo’ers were either joining or re-upping membership in the 4000-member advocacy group. Combined with raffles, clinics, guided rides, jump shows and acres of trail at all skill levels, the festival is evolving into the Pacific Northwest’s mini-version of Outerbike. Celebrity cameos were provided by Ibis-sponsored rider Jeff Kendall-Weed, whose new video of Invictus, “Washington’s gnarliest trail” at nearby Raging River, is getting wide play on social media. See for yourself. It’s a good one. Riders raved about the demo deal. Some shops charge anywhere from $60 to $90 to demo a single bike, albeit usually for 24 hours. 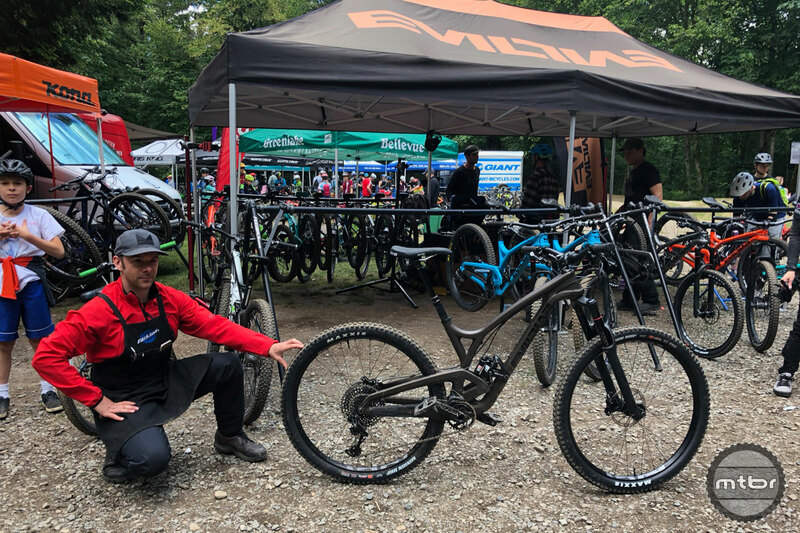 But most riders reported feeling like they got a good fix on a bike with 30 to 45 minutes given Duthie’s cornucopia of beginner, XC, jump, and flow trails. Despite having 60 bikes on hand, Pivot’s booth got the award for longest lines. Vendors had their latest and greatest on hand. 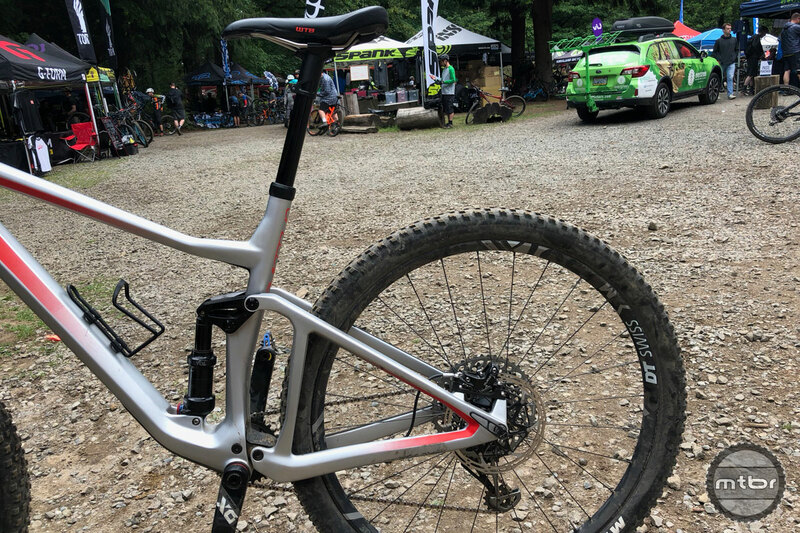 Pivot, which stocked 60 bikes from both its national and regional demo fleets, was seeing brisk demand for its new Trail 429 all-around 29er. Booth signs warned, “No Wristband, No Demo.” All day demos cost just $40 ($20 for members). Evil fans were rewarded with sneak-preview rides of LB (Little Better’er) Insurgents and Wreckonings. The upgrades feature new colors, bottle mounts and other tweaks. While demo bikes only are available now in limited distribution, the Wreckoning is scheduled for general release late this month, with the Insurgent due in July. BMC got strong word of mouth for the Speedfox’s clever integrated suspension system. On the sleeper side, BMC’s Speedfox was getting strong word-of-mouth from riders for its Trailsync integrated suspension. Activating the dropper post engages or locks out the suspension, corresponding to how extended the post is. The growth of flow and DH trails in the region was reflected in several vendors offering protective gear. Zoic’s booth was showing a new upgrade of its padded Impact liner, featuring tailbone and thigh protection in addition to hip coverage. Zoic’s DEFUZE foam soaks up and disperses more force, while its hexagonal shaping and blockchain configuration better conforms to body contours. 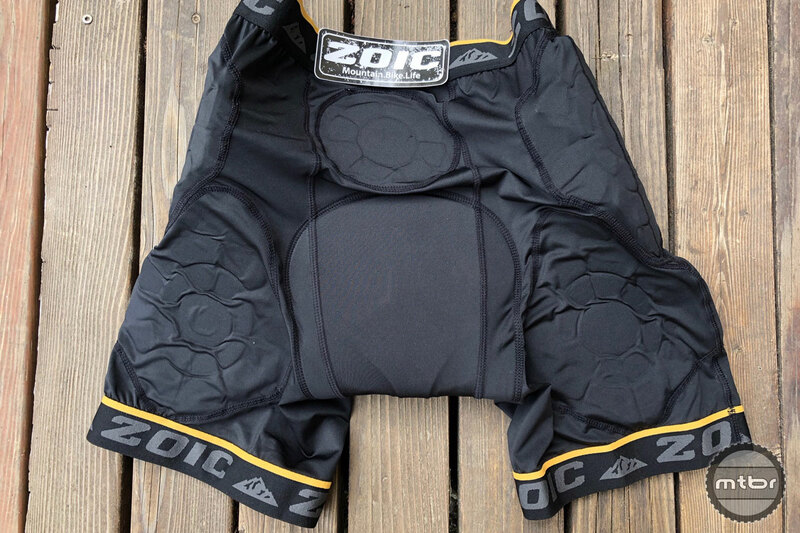 Zoic is offering the liners in both men’s and women’s versions. Zoic’s booth featured its newly updated Impact protective liners for both men and women. G-Form’s booth showed its new Pro Trail gloves as well as a full line of armor available for demo. The gloves feature back-of-finger foam padding for knuckle protection in crashes and wide-handlebar encounters with brush and trees. For more information please visit evergreenmtb.org. Evil COO Jason Moeschler sneak-shows the new Wreckoning LB in subtle but stunning bronze color. Pivot’s booth got the award for longest lines, despite having 60 bikes on hand. Booth signs warned, “No Wristband, No Demo” — all day demos cost just $40 ($20 for members). A correction FWIW, the demo arrangement was not a “twist” this year, they’ve been doing it for at least as long as I’ve been dropping by (the last three or so years, give or take). Fun times for sure, though. They’re CHARGING for demo rides?! That’s like charging people to watch commercials on TV. I’m getting really tired of the expense involved in this sport. I won’t be paying for any demo rides. Yah shame on those gullible enough to pay. Paul does this help fund the local trail maintenance ? $20 to demo as many bikes as you want all day long isn’t exactly a great expense. Many shops charge between $50-$70 just to demo one bike. I was there. Demo’d 6 bikes over the course of the day. It was totally worth it to me to be able to try different bikes for fit, geometry, etc. Only downside is I don’t feel like you can truly test the full capabilities of a bike at Duthie. The terrain is relatively flat and tame compared to many other trails in our area. Still awesome though! It’s actually $40 if you’re not a member. Presumably bike makers want to sell bikes so having riders demo them should not cost the riders. The bikes are already marked way up over what it costs the companies to procure them from China. I’d much rather have the donation to the trail group be asked for not forced if you want to demo ride. Or have the bike makers pay the trail group fee. Riders pay for everything: race teams, R&D, marketing etc. Cut ’em a break already. My take on the above article is that the $20-$40 goes to Evergreen Trail Alliance. Money well spent to such a great trail organization!